Are you thinking about home renovations? 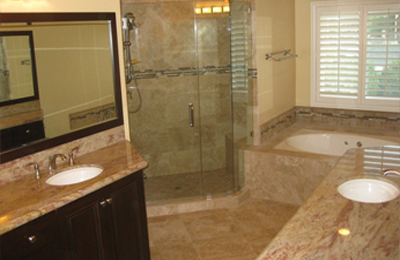 My Space Remodeling is a family owned and operated business serving La Habra, California with outstanding room addition, kitchen remodel, and bathroom remodel services. With skilled crews using only top-quality materials and fixtures, we guarantee your satisfaction. So let our experienced designers and managers take your ideas into the real world for stress-free La Habra home improvement projects. We’re a fully licensed and insured general contracting firm, so there’s no need for you to deal with scheduling and coordinating carpenters, plumbers, electricians, roofers, and painters. We’ll take care of everything, start to finish. Buy versus Renovate in La Habra, California? For the big picture, the typical advertised (list) price for a house in La Habra is $675,000 (mid-2016, http://www.realtor.com/local/La-Habra_CA) but the typical selling price is much lower at $489,000. Actually there’s quite a range, from $310,000 for a small townhouse to $1,023,000 for a much larger single family home, averaging some $350 per square foot (https://www.househunt.com/home-prices/CA/La_Habra/). Room additions can cost anywhere from under $200 per square foot (simple projects with no plumbing and little wiring) to over $400 per square foot for a deluxe master suite and bathroom remodel. So in most cases adding a room has a cost advantage over buying up. We’re often asked for the “rough cost” of a room addition, right a way in the very first phone call. That can range tremendously, so as with our bathroom remodeling and kitchen remodeling services we’ll learn your wishes and priorities before we start talking budgets. So just what room addition do you have in mind? An additional bedroom, bath, family or playroom, or home office? Perhaps an entire master bedroom suite, or apartment? We’ve done it all. And from that experience we know that most people want to keep their backyard living space (we’re also experts at patio enclosures and sunrooms, outdoor kitchens with top-quality patio covers, decks, and gazebos). That often means a second story addition. 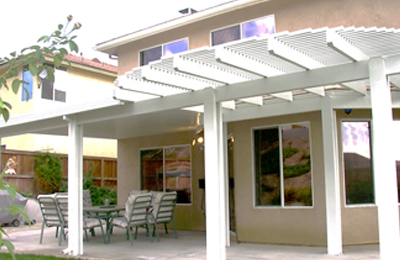 We’re specialists if La Habra zoning allows it we can build it safe and sound. 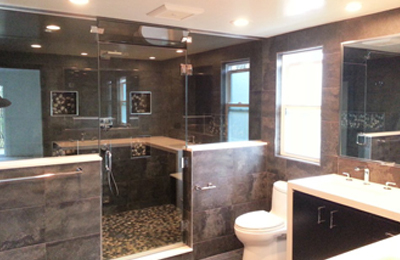 If something seems missing from your morning routine it might be time for a bathroom remodel. That could be a bright and cheerful room for the morning and a relaxing tone for the evening. La Habra residents love a cottage style for small baths, and multiple luxury features for larger areas. 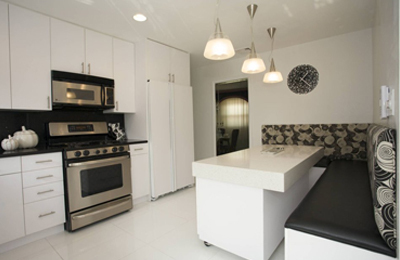 How about a spacious custom walk-in shower, or a jacuzzi tub for your own private spa? Say goodbye to out of stye glazed ceramic tiles and hello to porcelain and glass tiles or natural stone. 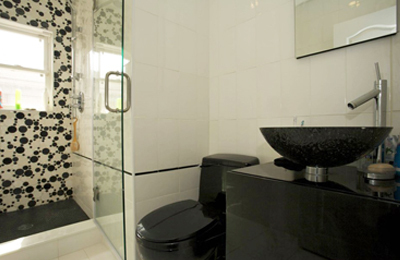 For efficiency and privacy, how about some partitioned areas within the bath suite? My Space designers and crews pay attention to every detail including, quite literally the kitchen sink (have you seen the latest in farmhouse and designer sinks and faucets?). Today natural stone, such as granite countertops are a must for any kitchen remodel. 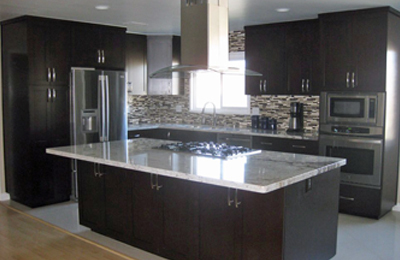 And open or glass-faced kitchen cabinets are extremely popular in La Habra. The latest in appliances will make a big difference, as will attention to lighting for ambiance as well as work needs. Do you want efficiency and low maintenance? Or the utmost in decor and the latest features? Need more space? Perhaps an island with double-sinks, a dishwasher, or a range. Or a completely new layout that optimizes functionality. There’s so many amazing choices of styles, color schemes, and materials you’ll really appreciate our designer’s eyes in creating exactly the style you want for superb kitchen remodeling. US News and World Report recommends that you take your time and make a carefully considered choice to take the risk out of renovation projects (http://money.usnews.com/money/personal-finance/articles/2014/11/14/18-tips-for-finding-a-reliable-home-contractor). A big part of that is choosing an experienced general contractor with the right credentials. That way a single company will be responsible for everything. Here is an outline of the key steps. Do your research on each and every one. First, make some clear decisions about what you really want and need, and what is and isn’t reasonable within your budget. Get rough estimates from several contractors, and when considering companies look for projects they’ve done that are similar to what you’re after. Narrow it down to about 3 companies and get detailed estimates, or better still a firm bid. Before comparing prices be sure that everything you’re expecting is indeed there, in writing. Don’t just compare costs — compare quality and the reputation of the contractors. 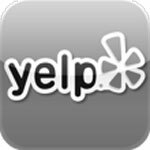 Then complete you “due diligence”by verify their licensing, insurance, and references. Before signing any contract, read it thoroughly and make sure that all tasks and costs are included. There should even be a list of things that are not included! You may need some help on this, but it’s time and money well spent. The City of La Habra has its own building department, with its own permit requirements and zoning. So it’s best to check with them first (http://www.lhcm.org/Faq.aspx?QID=138) to see if home improvements such as a second-story addition are allowed at your address. Before anything other than superficial work (such as painting and carpet) starts there has to be one or more building permits. The application and approval process involves submitting detailed plans that are carefully reviewed by La Habra officials to comply with numerous codes developed for safety and other protections. So for most projects those plans need to be created by an experienced professional.